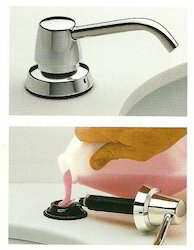 A Soap Dispenser is a device that when triggered appropriately yields soap. It can be manually operated or can be automatic. Soap Dispenser is a hand-free battery powered dispensers of soap which can also be used for other liquids such as shampoo and hand lotions. 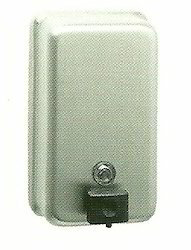 These dispensers are most commonly found in rest rooms in public and commercial buildings. The Automatic Soap dispenser dispenses soap when a sensor detects motion under the nozzle. It also comes with an electronic component that allows for a timing device or signal. This can indicate to the user whether their hands are washed for the correct amount of time. 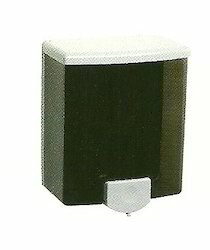 Our offered Mounted Soap Dispenser is designed for suitability with all kinds of washroom setups. These soap dispensers are sure to add convenience in keeping hands clean. This is crafted from durable materials; they are sure to last long and look fabulous in washroom. This comes with a vandal-resistant locking cover and a free-turning spout for comfortable use. Our offered Soap Dispenser are designed for use of all purpose hand soaps including liquid and lotion soaps, synthetic detergents, and antibacterial soaps containing PCMX and /or Triclosan. This gives a quick and easy, professional look with a dash of utility and performance. Moreover, its perfect selection of material and design enable protection from wreckage. Our offered Surface Mounted Soap Dispenser is a liquid, tank-type soap dispenser made of stainless steel with black ABS plastic valve. 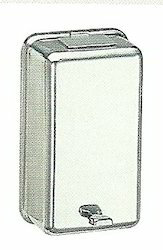 This conveniently dispenses all-purpose hand soaps and is ideal for higher end hospitality and other commercial restrooms. Additionally, the hinged filler-top requires special key to open making its hooligan resistance. Our offered Recessed Soap Dispenser is a wall mounting dispenser that is suitable for all types of liquid soaps and lotions. This corrosion resistant dispenser is made from stainless steel that looks attractive and serves the purpose. 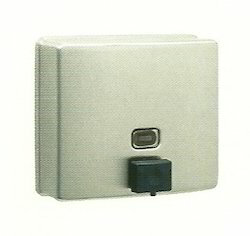 Furthermore, it comes with a concealed wall fastening and a hinged filler-top that requires special key to open. Vertical tank is satin-finish stainless steel. Corrosion-resistant valve dispenses commercially marketed all-purpose hand soaps. Capacity:1.2L(40 fl oz). Soap refill window. 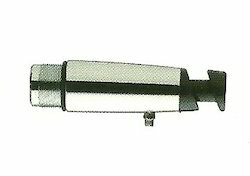 Concealed wall fastening. Hinged filler-top requires special key to open. Vandal resistant. Satin-finish stainless steel. Door has 90º return, conceals flange. Enclosed plastic soap vessel on back of door swings open for easy filling. Horizontal tank is satin-finish stainless steel. Corrosion-resistant valve dispenses commercially marketed all-purpose hand soaps. Concealed wall fastening. Container is satin-finish stainless steel. Dispensing mechanism with stainless steel lever dispenses any free-flowing powdered soap. Agitator spring prevents soap build-up. Top opens with special key provided. 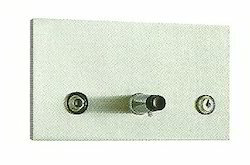 concealed wall fastening. Two-tone styling in black and grey. Corrosion-resistant valve dispenses commercially marketed all-purpose hand soaps. Vandal resistant lid has unique keyless locking device. Lid pivots up after lock is disengaged for easy top filling. Unit is removable from wall for cleaning. Eliminated frequent refilling of single soap dispensers, reducing maintenance time an labor costs; check and top-fill from any dispenser. 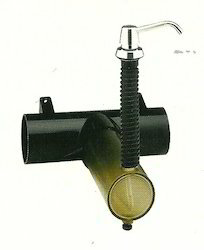 Features B-822 Series soap dispensers with 915mm(36 in)long supply tube which can be cu-to-fit in the field. Equipped with 255mm(10 in)long, translucent plastic elbow for visible soap level and 840mm(33 in)flexible connector hose which can be cut-to-fit in the field. Specify one unit for each basin;each providing 3.3L(0.9 gal)soap capacity, plus capacity of pipe connections. For models B-2111 and B-306. Valve operates with less than 22. 2N. Hidden opening level to ensure security against vandalism. You can have an option to use either the refillable container or disposable soap cartridge with box. Hands are easily caused of cross contamination. No-touch dispensing means hygiene and convenience. 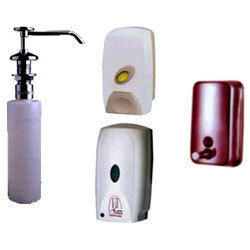 Supplier of - Air Freshener Dispenser, Soap Dispenser Chennai.